Health awareness and restrained young drinkers are driving demand for booze-free tipples. Growth in volumes of low-alcohol beer will outstrip traditional drinks fivefold next year. It’s a new source of expansion for global companies as the craft beer craze loses its froth. Sapporo just acquired San Francisco's Anchor Steam, a godfather of American craft ale. Kirin already bought a stake in Brooklyn while Asahi took over Peroni and Grolsch. All three are profit laggards. Overseas shopping diverts from a more pressing matter: consolidation in Japan. At first blush, Constellation Brands, with roots in an upstate New York vineyard, and Brown-Forman, maker of Confederate tipple Jack Daniel's, seem to have little in common. But a heritage of family control, maintained via dual-class shares, makes a $56 bln union look doable. The Dutch brewer is the largest shareholder in India's biggest beer maker. An embarrassing agreement with arrested tycoon Vijay Mallya leaves Heineken bound to accept him as chairman. Heineken should lead a charge to sack him anyway and hope to win any resulting legal battle. Liquor baron Vijay Mallya fled to the United Kingdom after banks sued to recover $1.4 billion. If his arrest leads to extradition it would make an example of the poster child of India’s bad loan problem. That would help New Delhi sell any bailout of state banks to the public. AB InBev bought the UK beer giant in 2016, but only after SABMiller tried to copy its rival's M&A machine. Last week's aborted $143 bln bid for Unilever by Kraft Heinz – like AB InBev, part of 3G Capital's stable – may nudge General Mills, Mondelez et al into similar pursuits. The Japanese brewer is looking to offload a 20 pct holding in its Chinese peer, worth about $1.2 bln. Carlsberg is reportedly circling. Asahi achieved little and has made mediocre returns. At least the next owner can avoid its biggest mistake – paying a whopping great premium. The Danish brewer’s full-year results show Cees ‘t Hart’s turnaround plan is helping profit margins. He also closed a valuation gap with Heineken and beat AB InBev on investor return since taking over. But Carlsberg’s presence in tough markets caps how much more can be done. The brewer may buy Kirin's Brazil unit for a mooted $872 million. The deal would give the company a 20 percent share of a difficult market, still well behind dominant AB InBev. The target is loss-making, but Heineken has reason to believe it can do a better job. The Danish brewer missed first-half sales and operating profit expectations. Its cost-cutting strategy is starting to bear fruit in better profit margins. But even a perfectly executed turnaround risks being watered down by exposure to some of the world’s trickiest beer markets. The Dutch brewer's operating profit was strong, thanks to stellar Asian growth. But first-half revenue fell short of expectations. Headaches in Africa show that its reliance on emerging markets comes with a snakebite of currency, macroeconomic and geopolitical hazards. An offer of 71 billion pounds that SABMiller accepted from AB InBev in November no longer looks generous - and not just because sterling has plunged. SAB’s board still has time to push for a better deal, or at least get a second opinion. 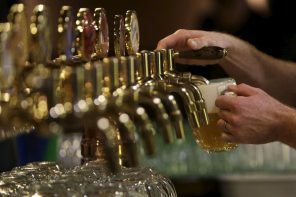 The Hong Kong-listed brewer got a great price from AB InBev for the remaining 49 pct of China's top beer brand. Now it is raising $1.2 bln in a rights issue. With the purchase from ABI on track to close soon, and CR Beer's shares performing well, raising equity makes sense.